Waste Connections conducts business in Canada through various operating subsidiaries and we are continually looking for ways to improve the value, quality and service we deliver to our customers. This policy is intended to help you understand some of the line items on your bill in an open and transparent manner, and to explain how we strive to control our costs and minimize the impact to our customers. One of the line items on your bill is a Fuel Surcharge. This amount fluctuates monthly, and tracks changes (up and down) to the price of diesel and similar hydrocarbon-based fuels and related products used to operate our fleet of vehicles. The surcharge allows us to control such fuel costs so that we are able to maintain a reasonable operating margin for our business. In Canada, the Fuel Surcharge is tied to the “Canadian Average Retail Price for Diesel” (on a per litre basis) as listed on the Natural Resources Canada website using the peak weekly price per litre from the preceding calendar month (the “Canadian Retail Price”). This index is widely used in the trucking and transportation sector as a basis for fuel related pass through costs. 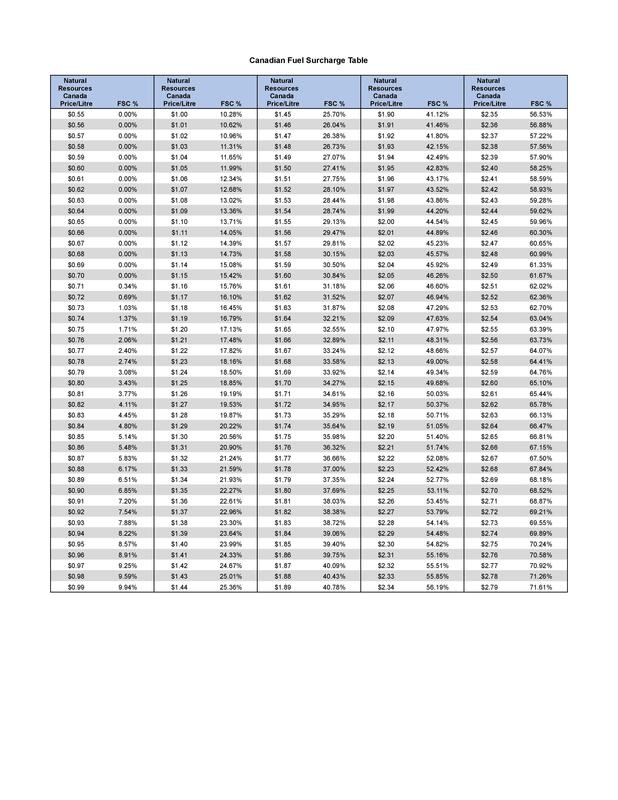 The Canadian Retail Price (as determined by the above index) is then referenced to the Waste Connections Fuel Surcharge Table to determine the percentage amount applied to your monthly invoice charges, before tax. Because the charge fluctuates with external prices, the charge will increase as the cost of fuel increases and will decrease when external fuel prices decrease. The fuel surcharge remains constant when the Canadian Retail Price is equal to or falls below $0.70 per litre , which is our baseline fuel rate in Canada. You should be aware that the amount charged on your invoice is not directly associated with the cost of servicing your specific account; rather, it is based on Waste Connections overall cost of fuel and petrochemical related products incurred on a corporate basis and designed for us as a company to achieve an acceptable operating margin. Unlike the Fuel Surcharge, the Environmental and Regulatory Surcharge does not fluctuate monthly and is currently set at 15% of your invoice charge, excluding tax. This fee is in place to help us recover the ongoing and increasingly complex environmental and compliance costs associated with the high quality operation of all Waste Connections collection, transfer station, landfill, material recovery and waste-to-energy facilities on a corporate basis. Like the Fuel Surcharge, the Environmental and Regulatory Surcharge is not related to the specific costs of servicing your account, but on the costs incurred on all operations across the company so that we can achieve an acceptable operating margin. The Administrative Fee on your bill relates to the costs associated with generating invoices, processing your payments and other transaction fees that may be associated with your account. The price of such fee is set so that it covers such costs and allows us to maintain a reasonable operating margin. The administrative fee is currently set at $8 per month. The Container Maintenance Fee on your bill is a monthly amount that Waste Connections charges a customer to allow it to switch out a container, for any reason, for one of the same size once per year. If you wish to switch out a container more frequently or are not assessed a Container Maintenance Fee on your bill, you will be charged an Exchange Fee equal to the rate listed on your Service Agreement each time a container is switched at the service address site. Each of the different surcharges and fees will be shown as separate line items on your invoice. In some cases, we may combine the Fuel Surcharge and the Environmental and Regulatory Surcharge together and in each such case, the percentages of each component are simply added together to get a combined percentage that is applied to the total invoice amount, excluding tax. For example, in Canada , if the fuel component derived from the Waste Connections Fuel Surcharge Table is 15.08% (based on a Canadian Retail Price of $1.14 per litre) and the total invoice amount is $100, the total Fuel & Environmental charge would be $30.08 (15.08% plus 15.0%). You should be aware that none of the fees described in this policy are taxes imposed by and submitted to a governmental agency. These are charges used to recover costs that Waste Connections incurs on a company-wide basis and to help us achieve an acceptable operating margin. Changes to this pricing policy may be made at any time at the discretion of Waste Connections management team and as circumstances may necessitate. We will notify you of changes to our policy on your next applicable invoice (and at which time such changes shall be effective) and consent shall be deemed to be given upon payment of funds following such notice unless your service agreement expressly states consent must be provided for in a different manner. You should be aware that the amount charged on your invoice is not directly associated with the cost of servicing your specific account; rather, it is based on Waste Connections’s overall cost of fuel and petrochemical related products incurred on a corporate basis and designed for us as a company to achieve an acceptable operating margin. In the province of Quebec, all customers will see a charge related to levies imposed on waste disposal operators such as Waste Connections when disposing of materials at landfills. Roll-0ff customers will receive a fee of $23,07 per metric tonne while all other customers receive a fee equal to 30,3% of their base monthly services rate. The specific charge imposed on your account may not directly correspond to the levy imposed by the Quebec government but is assessed by us based on the costs incurred on all our operations in the province of Quebec related to the levy. The charges are set at a level designed for us as a company to achieve an acceptable operating margin. Each of the different fees will be shown as separate line items on your invoice. Changes to this pricing policy may be made at any time at the discretion of Waste Connections’s management team and as circumstances may necessitate. We will notify you of changes to our policy on your next applicable invoice (and at which time such changes shall be effective) and consent shall be deemed to be given upon payment of funds following such notice unless your service agreement expressly states consent must be provided for in a different manner. This Pricing Policy applies to all contracts for service in the USA which incorporate the terms of this policy, except contracts for services within the State of Florida. This policy is designed to help you understand some of the charges on your bill. These charges may vary based upon your service location. Your invoice might include one or more of the following charges. The Fuel Surcharge relates to the price of diesel and similar hydrocarbon-based fuels and related products used to operate our fleet of vehicles. This amount may fluctuate monthly. Environmental and Regulatory Surcharges are in place to help us recover the ongoing and increasingly complex environmental and compliance costs associated with the high quality operation of all collection, transfer station, landfill, material recovery and waste-to- energy facilities. Administrative or Invoice Fees relate to the costs associated with generating invoices, processing your payments and other transaction fees that may be associated with your account. Container fees are monthly charges providing you with the right to switch out a container once per year, for any reason, for one of the same size. If you wish to switch out a container more frequently, you will be charged a separate exchange fee. Each of the different surcharges and fees might be shown as separate line items on your invoices or combined on your invoices. You should be aware that none of the fees described in this policy are taxes imposed by and submitted to a governmental agency. These are charges used to recover costs incurred on a regional or company-wide basis and to recover operating margins. The charges and any adjustments thereto might not be directly associated with increased costs of servicing your specific account; rather, the charges and any adjustments thereto might be based upon costs and expenses incurred on a regional or national basis. Changes to this pricing policy may be made at any time. We will notify you of changes to our policy on your next applicable invoice (and at which time such changes shall be effective) and consent shall be deemed to be given upon payment of funds following such notice. Except for Excluded Claims (as defined below), any controversy or claim (collectively “Claims”) arising out of or relating to this Pricing Policy or the charges in your contract shall be resolved by mandatory binding arbitration before a single arbitrator administered by the American Arbitration Association in accordance with its Commercial Arbitration Rules (collectively “Rules”), and judgment on the award rendered by the arbitrator may be entered in any court having jurisdiction thereof. Claims to collect past due charges or liquidated damages from customers are not subject to mandatory binding arbitration (collectively, “Excluded Claims”). Any and all Claims, whether in arbitration or otherwise, must be brought in a party's individual capacity, and not as a plaintiff or class member in any purported class, consolidated, collective or representative proceeding. Accordingly, each customer with a contract which is subject to this Pricing Policy hereby waives any and all rights to bring any Claim as a plaintiff or class member in any purported class, consolidated, collective or representative proceeding. This agreement to arbitrate Claims and waiver of class actions rights is governed by the Federal Arbitration Act (9 U.S.C. sections 1 et seq.) and evidences a transaction in interstate commerce. Notwithstanding anything to the contrary herein or in the Rules, this Article shall not be severable from each contract in any case in which the dispute to be arbitrated is brought as a class, consolidated, collective or representative action, and only a court, and not an arbitrator, may adjudicate any contention that any portion of this Section is unenforceable, void or voidable. Waste Connections conducts business in the United States through various operating subsidiaries and we are continually looking for ways to improve the value, quality and service we deliver to our customers. This policy is intended to help you understand some of the line items on your bill in an open and transparent manner, and to explain how we strive to control our costs and minimize the impact to our customers. In the United States, the Fuel Surcharge is tied to the “US On-Highway Diesel Fuel Prices” (on a per gallon basis) as listed on the U.S. Department of Energy website using the peak weekly price per gallon from the preceding calendar month (the “US Retail Price”). This index is widely used in the trucking and transportation sector as a basis for fuel related pass through costs. 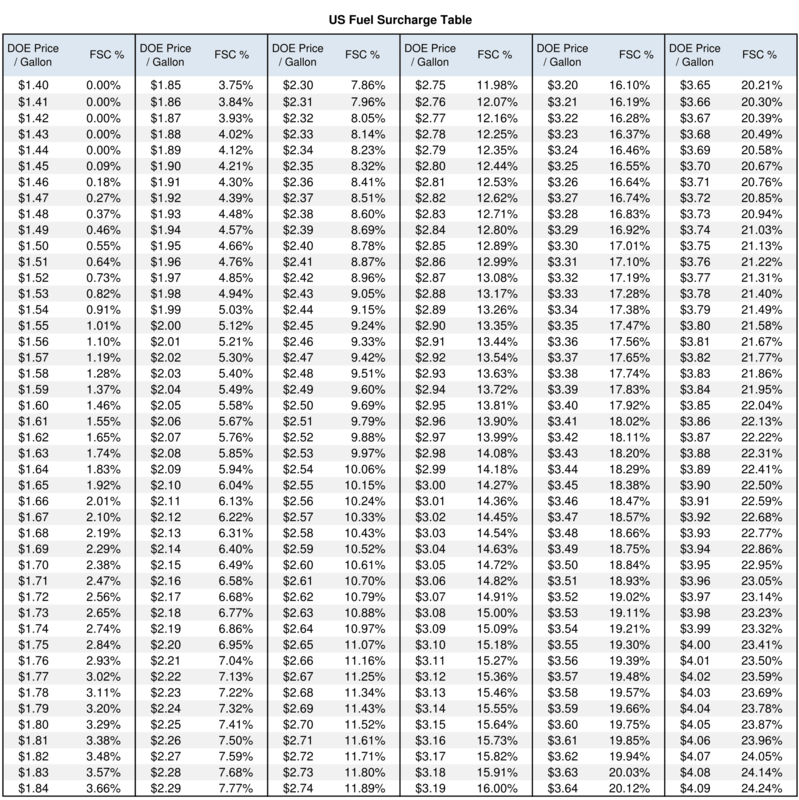 The US Retail Price (as determined by the above index) is then referenced to the Waste Connections Fuel Surcharge Table to determine the percentage amount applied to your monthly invoice charges, before tax. Because the charge fluctuates with external prices, the charge will increase as the cost of fuel increases and will decrease when external fuel prices decrease. The fuel surcharge remains constant when the US Retail Price is equal to or falls below $1.44 per gallon, which is our baseline fuel rate in the United States. Unlike the Fuel Surcharge, the Environmental and Regulatory Surcharge does not fluctuate monthly and is currently set at 12% of your invoice charge, excluding tax. This fee is in place to help us recover the ongoing and increasingly complex environmental and compliance costs associated with the high quality operation of all Waste Connections collection, transfer station, landfill, material recovery and waste-to- energy facilities on a corporate basis. Like the Fuel Surcharge, the Environmental and Regulatory Surcharge is not related to the specific costs of servicing your account, but on the costs incurred on all operations across the company so that we can achieve an acceptable operating margin. The Administrative Fee on your bill relates to the costs associated with generating invoices, processing your payments and other transaction fees that may be associated with your account. The price of such fee is set so that it covers such costs and allows us to maintain a reasonable operating margin. The administrative fee is currently set at $8 per invoice. The Container Fee on your bill is a monthly amount that Waste Connections charges a customer to allow it to switch out a container, for any reason, for one of the same size once per year. If you wish to switch out a container more frequently, you will be charged an Exchange Fee equal to the rate listed on your Service Agreement each time a container is switched at the service address site. The container fee is currently set at $10 per container per month. Each of the different surcharges and fees will be shown as separate line items on your invoice. In some cases, we may combine the Fuel Surcharge and the Environmental and Regulatory Surcharge together and in each such case, the percentages of each component are simply added together to get a combined percentage that is applied to the total invoice amount, excluding tax. For example, in the United States, if the fuel component derived from the Waste Connections Fuel Surcharge Table is 14.27% (based on a US Retail Price of $3.00 per gallon) and the total invoice amount is $100, the total Fuel & Environmental charge would be $24.27 (14.27% plus 10.0%).